What a start to the Fringe. Week one is now over and it’s been a roller coaster. When you’re presenting new work the month becomes all consuming as you polish over and over again to get as close to the ‘perfect show’ as you can. Scripts are modified, illusions move around and the pacing changes. It occupies every moment. But is so rewarding when the audience leave the room with big smiles on their faces. Vanishing Point has been a labour of love, but each day when I see the Harmonic Pendulum in action and the wonderfully hypnotic effect it has on the audience it really makes it all worthwhile. I hope you can make it along. It’s almost a shame to be doing a show when there is so much other great work taking place all around. So I thought I’d take a moment to list a few of my favourites. Colin Cloud Psycho-logical (at the Fringe) – he’s just remarkably strong every year. Proper stadium mentalism with a few deliberate scares along the way. Home (at the EIF) – I’ve been a fan of Geoff Sobelle ever since I saw the Elephant Room many years ago at Assembly. He’s back at the EIF this year (promotion!) with HOME. I haven’t seen it yet but as far as quality work goes – Geoff does amazing things. 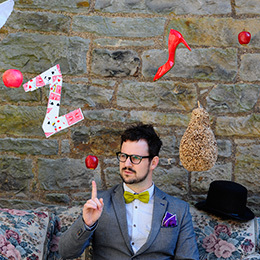 Nutshell by Ben Hart – wonderful fusion of storytelling and magic with one of the most creative magicians on the fringe. Card Ninja with Jav Jaquin – wonderful family ninja fun, with card throwing, ninja trials and belly laughs all rolled into one with one of my favourite performers on the circuit. Kaput – probably the best slapstick show I’ve ever seen. Worked with the incredibly talented Tom out in Adelaide Fringe this year. His show was sublime. Highly recommended. Around the World in 80 Dates by Chris Henry – Likeable, hilarious, Chris is the complete all rounder. He’s worked incredibly hard over the years perfecting his work. He’s been selling out pretty much every day this year. This show is a winner. Break Free – Wow. Japanese break dance squad performing a narrative driven dance piece. Sounds pretty interesting?! It absolutely delivers. Wonderful moves, minimalist story and high energy vibe. Great for the whole family. Glittery Clittery –the fringe wives club. Great songs, great comedy. Uplifting and eyeopening.